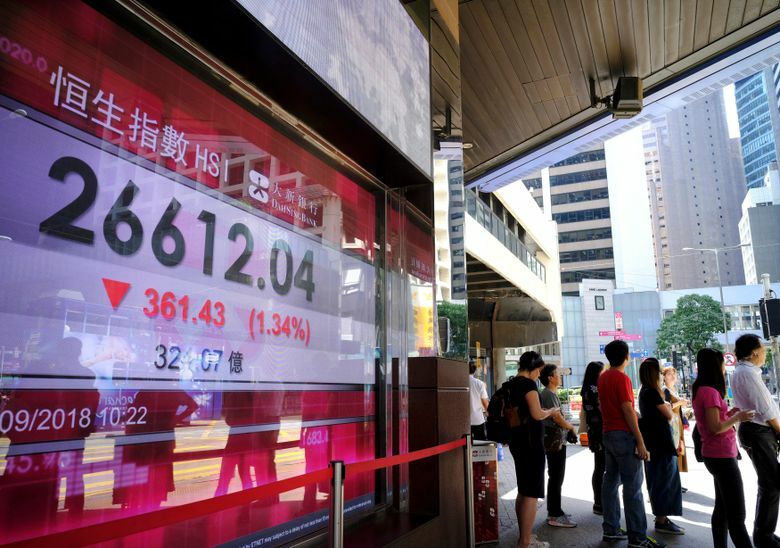 SINGAPORE (AP) — European stock markets rose and Wall Street was expected to open higher on Monday, despite a drop in Asia, where investors fretted over the possibility of new and bigger U.S. tariffs on Chinese goods. KEEPING SCORE: In Europe, France’s CAC 40 was up 0.5 percent at 5,277, while Britain’s FTSE 100 gained 0.3 percent to 7,301. Germany’s DAX gained 0.4 percent to 12,010. On Wall Street, Dow and S&P 500 futures both added 0.4 percent. 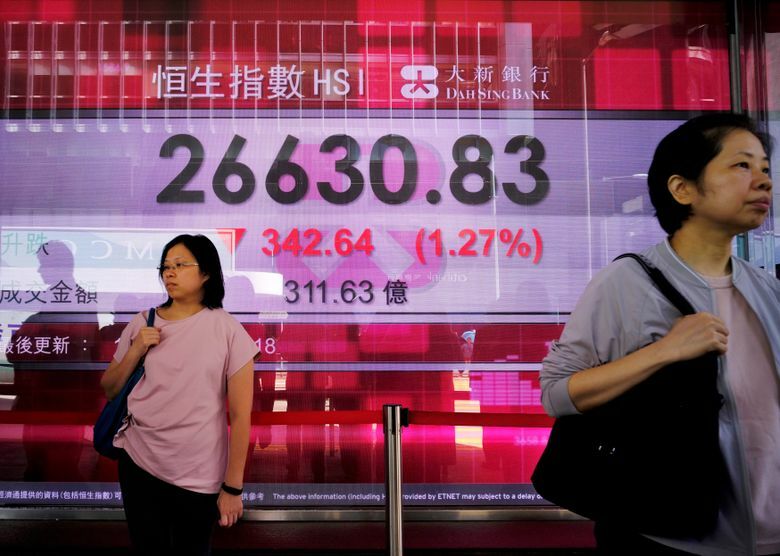 ASIA’S DAY: Hong Kong’s Hang Seng index tumbled 1.3 percent to 26,613.42 and the Shanghai Composite index gave up 1.2 percent to 2,669.48. 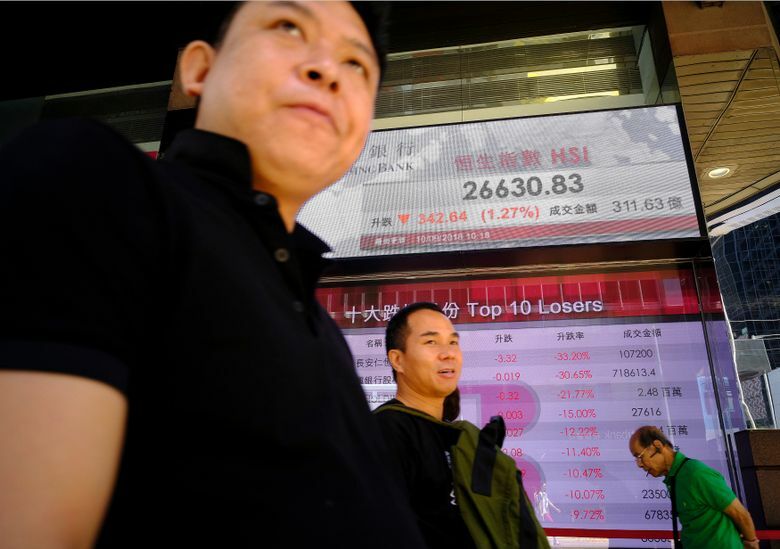 Japan’s benchmark Nikkei 225, however, climbed 0.3 percent to 22,373.09 after the country’s gross domestic product surpassed expectations by growing at a 3 percent annual rate in the April-June quarter. Australia’s S&P/ASX 200 was less than 0.1 percent lower at 6,141.70 and the Kospi in South Korea gained 0.3 percent to 2,288.66. U.S.-CHINA TRADE: On Friday, U.S. President Donald Trump told reporters that $267 billion in potential new tariffs, which would essentially hit every product imported from China, were “ready to go on short notice if I want.” Such a step would significantly escalate his trade war with Beijing and would likely increase costs for a broad range of U.S. businesses and consumers. The Trump administration is already poised to slap tariffs on $200 billion worth of goods from China, such as handbags and bicycle tires. The U.S. has already imposed tariffs on $50 billion in Chinese products, for which Beijing has retaliated with an equal amount of import taxes on U.S. goods.